I’m preparing to release my second short story in the series, Misadventures In La Mosquitia, and it involves bees. (Trust me it’s worth the download price.) I’m in need of a good bee picture; bees on a honeycomb, bees swarming on a natural hive, bees on some sort of neutral background I can put my title on and such. I’m willing to use a public domain picture, but I don’t want to see my book cover picture on some other product later on. I don’t mind doing some sort of service in return for the picture. So if you own a picture you think might be suitable, send me a link to it and if I want to use it we can correspond about it. I’ve never solicited anything more than some good advice on this blog before. So I don’t know if I’m going about this the right way. If anyone has any suggestions on other ways to go about this or where I might acquire the perfect picture for my cover, please comment here. I’m certainly no expert, but perhaps if you got hold of a photo you wanted in the public domain, then you could edit it quite significantly so it would make it individual. I mean something like change the colour scheme/contrast/exposure, make it look ‘vintage’, B&W, etc etc. I genuinely have no idea if this it would be legal or not though, but just an idea. Unfortunately I don’t have any bee photos to speak of, or I’d gladly offer them. I’m working on an idea that sort of fits that description, TLS. Thanks for the affirmation. You’re right. That could be the way to go. If I don’t find any better way or get a good submission through these comments, I might do that. Another Idea is to pay a photographer, but I’m trying to do this publishing project with absolutely no expenditures other than my time and maybe a barter of services, just to see if it can be done successfully. If that’s your aim, I really think you should stick to it! There’s so many helpful people who are happy to be of service, I’m sure you can find a way without paying someone! Maybe if you posted a more in-depth description of what you’re looking for? I’ll keep trying. I sent you an email, hope to hear from you soon. Just started following your blog. I put out a twitter plea to my followers. HTH. I appreciate it, North. (Fisher?) The type of picture I’m searching for is something with a hot color, yellow would be good, I want to give the feeling of intensity or at least danger. It should also have bees on it and maybe even honeycomb in the background. It doesn’t necessarily have to be a photograph, but if it’s a drawing, maybe it should not portray the bees as being sweet little cartoon characters. Oh I really don’t know how to describe what I want but I think I’ll know it when I see it. Thanks for helping. I love your blog too, by the way. Thanks 6k, (I love your blogger name, by the way, it reminds me of 300 Spartans or something…), I’m loading the flickr page you posted right now. Is the picture yours? 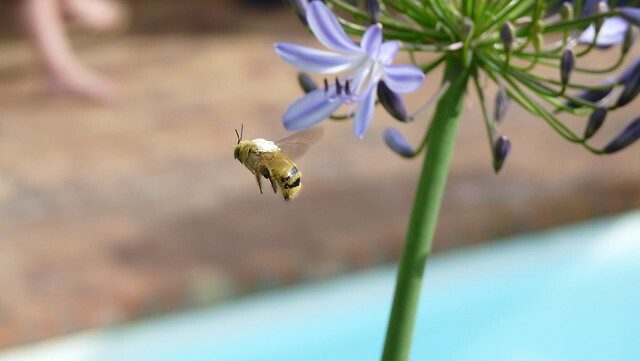 6000. that picture, while it is an EXCELLENT photograph of a bee, doesn’t quite match up with the story line I need a cover for. The story is about a bee attack from a beehive right outside my house. The bees were there for a few years and never bothered anyone until that day, so although it doesn’t have to be a completely menacing, “Silence Of The Lambs” type cover, it should definitely not be an innocent worker drone full of pollen and a beautiful flower in the background. As I said, the photograph is excellent, but it just doesn’t quite fit. Thank you. Do you have any more bee photographs I can look at?